Hello and welcome to another episode of Searching Standard. This week I have a deck for you that packs a punch but won't break your wallet. It was posted on the PokeBeach Forums by a user there named Wolfe_XD. If Blacephalon-GX decks are causing you nightmares, you should try this deck. If Buzzwole-GX is a pain in your side, you should try this deck. Heck, if Ultra Beast decks run rampant in your area, you should try this deck. Let's take a look at it. 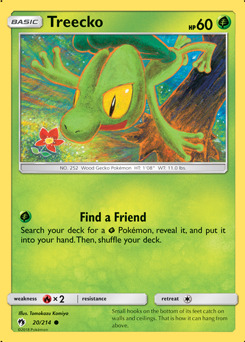 Treecko LOT 20 gets the party started in this deck with its Find a Friend attack. This allows you to find any of the other Pokemon in this deck since they are all Grass Type Pokemon. If you don't have one in hand, you'll want to find a copy of Grovyle LOT 21 as soon as possible. Feel free to find a Sceptile CES 10 if you already have Grovyle LOT 21 covered. 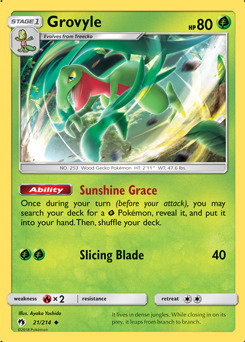 Once you're able to evolve into Grovyle LOT 21, you no longer have to rely on attacking to be able to find Grass Type Pokemon as you can find one each turn by using Grovyle LOT 21's Sunshine Grace Ability. 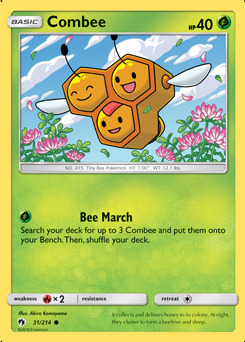 As you'll see, filling up your Bench is important for this deck so you'll usually want to search for a Combee LOT 31 if you don't have one. We'll talk more about that Pokemon later on. Sceptile CES 10 has the Power of Nature Ability that will protect all of your Pokemon that have a Grass Energy attached to them from any damage an opponent's Ultra Beasts might deliver. This ability can be backbreaking against certain decks. Sceptile-GX LOT 22 serves a special role in this deck. 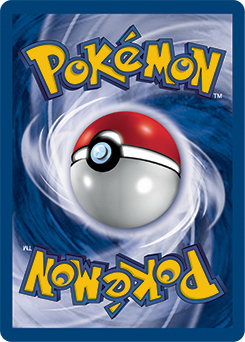 Since it's your only Pokemon-GX in the deck and you only have a single copy, you never need to worry about not being able to use its Jungle Heal GX attack. While you can still only use it once per game, when timed correctly you can gain a huge advantage over your opponent. By using it, you can heal all damage from any Pokemon you have with a Grass Energy attached to it. 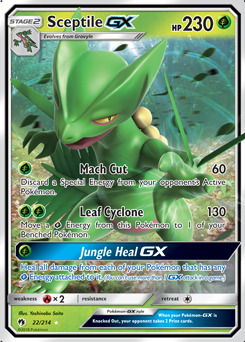 And by using Sceptile-GX LOT 22's Leaf Cyclone attack, you should be able to make sure any of your Benched Pokemon with damage on them also have a Grass Energy attached to them as well. Earlier I mentioned that you'll want to have a full Bench when playing this deck. Vespiquen LOT 32 is the reason why. Well, more specifically its Commanding Queen attack is the reason why. 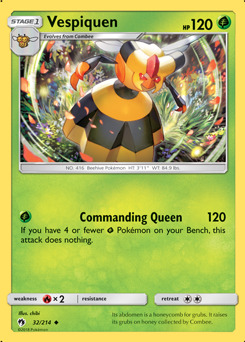 Without having a minimum of four Benched Pokemon, Commanding Queen will do nothing. In a pinch, you could always use Combee LOT 31's Bee March attack to help fill up your Bench if you need to. 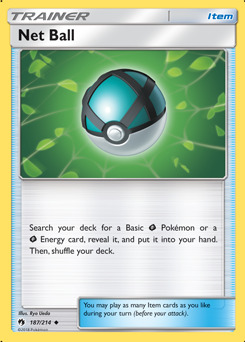 The final Pokemon in the deck is a lone copy of Shaymin LOT 33. 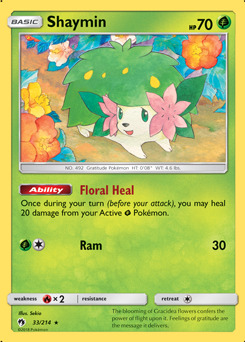 Thanks to Shaymin LOT 33's Floral Heal Ability, your Active Pokemon will be able to withstand extra damage and remain in play longer than usual. Shaymin LOT 33 isn't much for attacking, so plan on keeping it on your Bench. 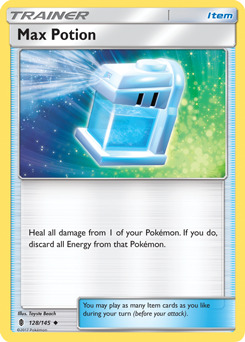 Speaking of ways to heal your Pokemon, this next group of cards is specifically here for just that purpose. Max Potion GRI 128 can heal all damage from one of your Pokemon, but it does so at a steep cost. 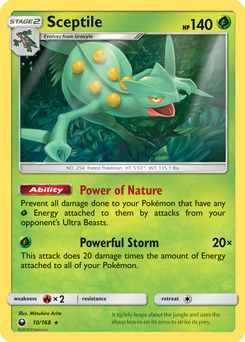 This is best used to heal your Sceptile-GX LOT 22 once you've distributed most of the Grass Energy attached to it to other Pokemon by using its Leaf Cyclone attack. 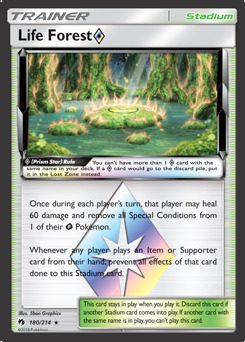 With any luck, Life Forest Prism Star LOT 180 will only heal up your Pokemon, assuming your opponent has no Grass Type Pokemon in play. 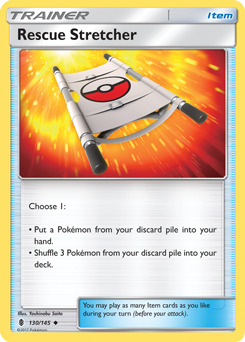 Finally, Rescue Stretcher GRI 130 allows you to get another use out of a Pokemon that has been knocked out (or possibly a few Pokemon if the second option is chosen). 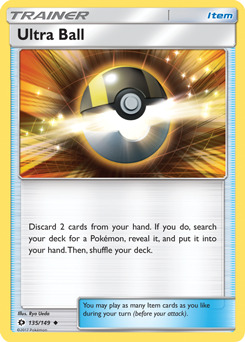 Every deck needs a way to search out specific Pokemon. In the event that Grovyle LOT 21, Combee LOT 31, and Treecko LOT 20 can't find what you need quickly enough, there are a variety of Poke Balls that can be used. 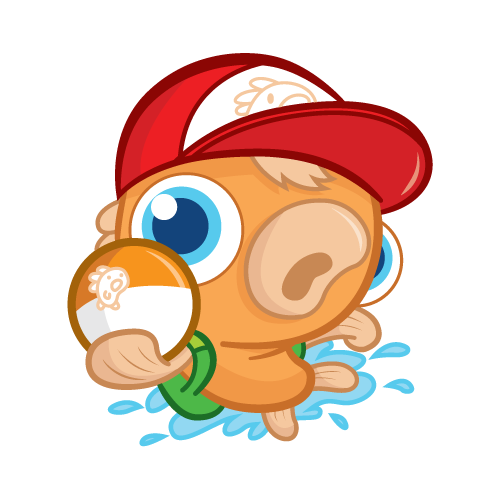 Keep in mind that Net Ball LOT 187 can also find you a Grass Energy if you've got enough Pokemon in hand. 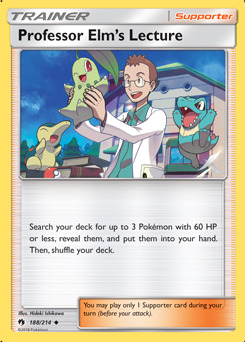 Professor Elm's Lecture LOT 188 is another great way to thin your deck some by searching for three Pokemon with 60 HP or less and adding them to your hand. While you can only find Treecko LOT 20 or Combee LOT 31, putting them into your hand gives you the knowledge that you're slightly more likely to draw something more useful in the late game. Every deck also needs a way to draw additional cards. 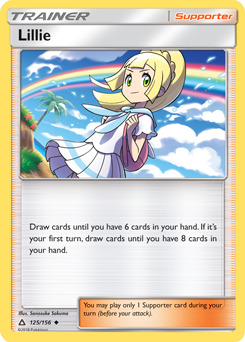 Cynthia UPR 119 and Lillie UPR 125 are almost universally played and with good reason. 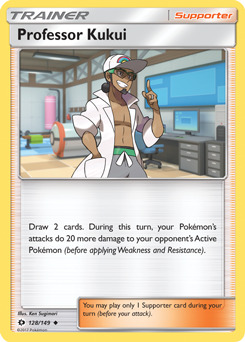 Professor Kukui SUM 128 serves a dual purpose by allowing a little card draw and adding additional damage to your next attack. Try to take advantage of this extra damage to deal a knock out when you normally couldn't without the added help. 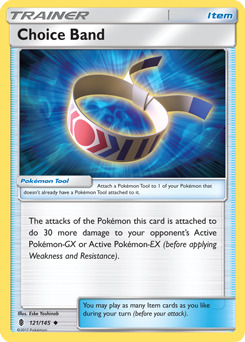 Choice Band GRI 121 is a great card to attach when you're facing a Pokemon-GX (or Pokemon-EX in other formats). 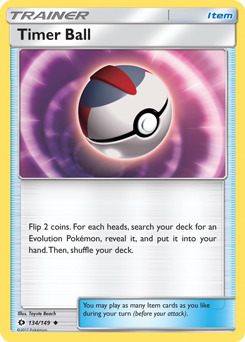 If you're relatively sure your opponent isn't playing any Pokemon-GX, you can always pitch this when you play an Ultra Ball SUM 135. 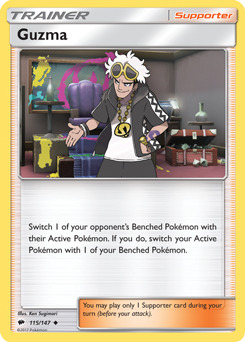 Both Field Blower GRI 125 and Guzma BUS 115 are cards seen in the majority of decks. They're both general all-purpose cards that you might need in any given battle. 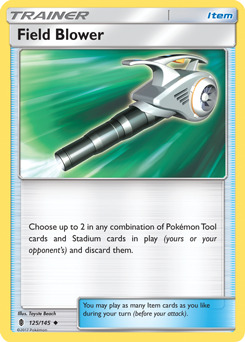 Like Choice Band GRI 121, Field Blower GRI 125 can be used to satisfy the discard requirement for Ultra Ball SUM 135 if you're not seeing many Pokemon Tools or Stadium cards. Guzma BUS 115 is a great way for you to get out of a jam or to single out an easy knockout. Kermit the Frog once said, "It's not easy being green." After seeing this deck, I don't believe that to be true. This deck looks like it could be a lot of fun and is a great deck to play wherever Ultra Beast decks are prevalent. 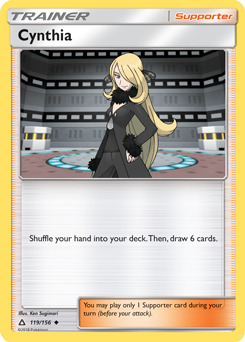 Thank you to PokeBeach.com Forum user Wolfe_XD for posting this decklist.